To all pizza lovers, here is a stunning pizza recipe that gives your taste buds an ultimate jolt. Chizza as the name implies, it is a chicken and pizza combo. Cool, right? I wondered and amazed when i hear this name for the first time at KFC. Wanna taste this freaky pizza as soon as possible. Yup, the breaded and fried chicken breast or chicken fillet is topped with pizza sauce and other pizza toppings. It sounds simple and yet interesting to me. 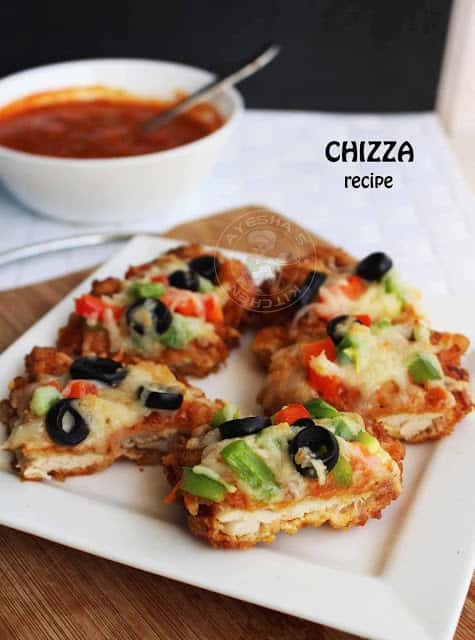 So I thought of reproducing this KFC style chizza recipe at my home. Anyways, this luscious meal made me proud when I try the same at home. It was really fun while layering pizza toppings over chicken crust. Though chicken breast is good for making chizza crust, I made this chizza using chicken thighs. 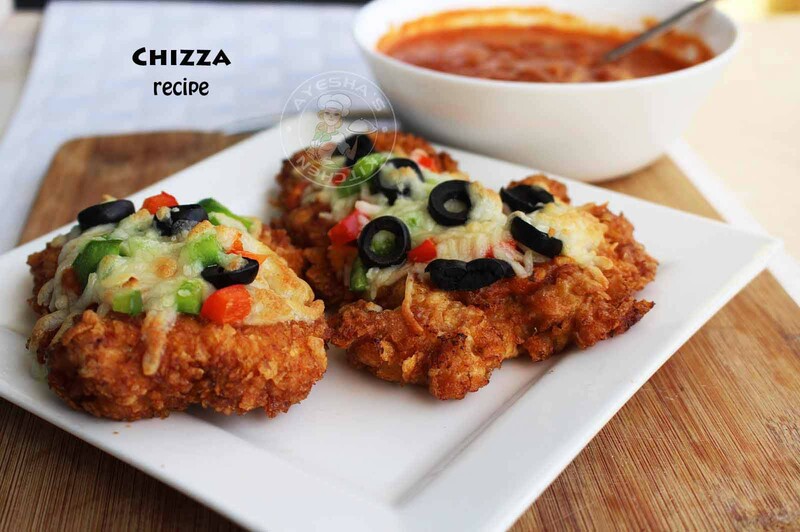 For sure, you can also substitute chicken thighs while making chizza. Debone the chicken thighs gently and carefully and then soak them in buttermilk mixture for making the meat soft and moist. 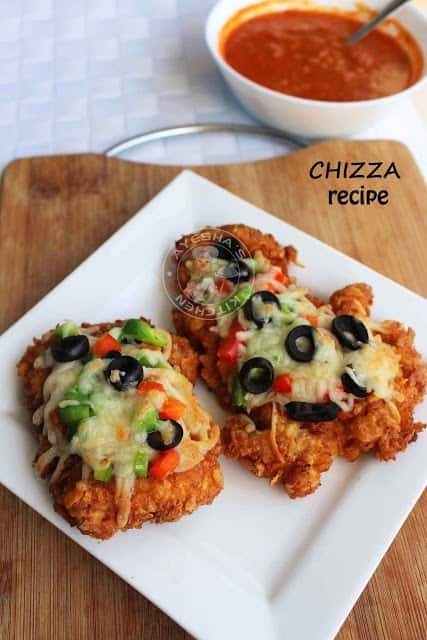 Ok, let us see how to make KFC style chizza at home. Now make a marinade using butter milk, garlic powder, chili powder, and salt. Soak the chicken fillets in this marinade. Refrigerate for 30 minutes. This makes the meat soft and juicy. In a bowl, add plain flour, chili powder, garlic powder, and salt. Mix well. Set aside. Whisk the eggs with a pinch of salt and set aside. Crush the cornflakes with hands and set aside. Now take out the marinated chicken, cover each chicken fillet with flour mixture, then dip in egg batter, roll in crushed cornflakes and set aside on a plate. Let it set aside for at least 10 minutes (preferably 30 minutes). Heat a pan for deep frying. Once the pan is hot, make the flame to medium and fry the breaded chicken one by one. Flip only when one side is done. Fry until the chicken turns golden. (Do not fry over a high flame or do not fry more). When done, transfer it to a paper towel and drain the excess oil. Transfer the fried chicken crust to a baking tray. Spread Pizza sauce over this chicken crust, put mozzarella, bell peppers, again mozzarella and finally sliced olives. Bake in a preheated oven, until cheese melts (for 5 minutes).